Quinoa pronounced (Keen-wah) resembles a grain but is really a seed of a leafy plant. It contains almost a perfect balance of the eight essential amino acids and is high in protein, calcium, and iron. 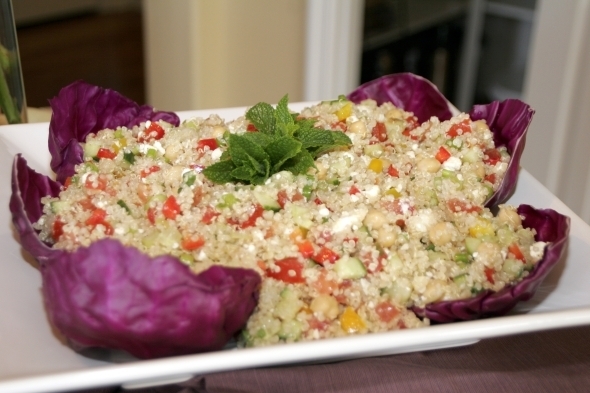 This is a nutritious light and tasty salad to snack on any time of day. Bring 4 cups water to a boil in a medium to large pot. Add Quinoa, cover and boil until water has absorbed, about 10- 12 minutes. Fluff with a fork, remove from heat and cover for 15 minutes. Uncover and allow quinoa to cool. This will yield about 6 cups of cooked quinoa. Set aside. Combine scallions, cucumbers, bell peppers, tomatoes, and garbanzo beans in a large bowl. Add cooled quinoa, salt, pepper, olive oil, lemon and toss. Add feta cheese and gently toss. Refrigerate until cold.